Tadcaster Albion manager Paul Marshall admitted he was ‘disappointed’ by his side’s work rate, despite their 2-0 win at Glasshoughton Welfare on Saturday. 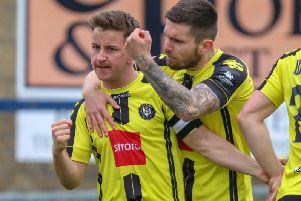 David Brown settled the points seven minutes from time with a quick finish with the win seeing the Brewers move clear at the top of the league as their four nearest pursuers were not in action. Glasshoughton have struggled so far this season, winning just three of their 26 games in the league so far but Marshall said his side did not have the right attitude for the clash. He said: “It was never going to be straightforward as the pitch was hard to play football on but that’s what you are going to get sometimes. “We looked okay in the first half but they thought they could just turn up and beat this side but you have to work harder than they do as well but we did not work hard on Saturday. “When Carl missed that penalty they thought they better step up and luckily we got the goal we needed just before half time. The win saw Tadcaster move eight points clear of Cleethorpes Town ahead of their upcoming clash at home to Thackley on Saturday. Marshall said he hopes his side have ‘learnt their lesson’ from Saturday heading into the game but said Denny Ingram and Josh Greening were still doubts through injury. Albion’s chase of a historic quadruple showed no signs of slowing down with a comfortable 6-1 victory at Retford United on Tuesday night. Marshall’s side navigated their way through the Toolstation NCEL League Cup fourth round tie but were given an early fright when Joe Coxon scored for the hosts within the first 60 seconds. However, Danny Gray ensured the visitors weren’t behind for long with a curling effort to equalise. Vincent Dhesi gave the brewers the lead soon after with Paddy Miller effectively ending the contest six minutes before half time. Tadcaster missed their second penalty in consecutive matches when Liam Ormsby failed to convert from the spot but Carl Stewart grabbed the fourth just after the hour mark. Callum Ward grabbed his 16th goal of the season before Stewart got his second and Albion’s sixth with a goal two minutes from time.